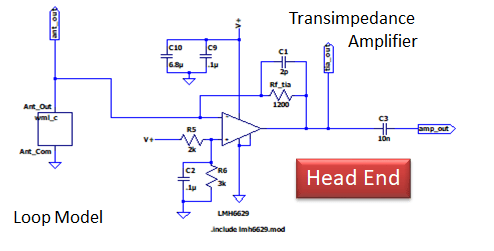 Implementing a wideband loop antenna head end appears fairly simple with a transimpedance amplifier. But there are some tradeoffs between gain, stability and bandwidth you need to make. So, in my wideband diversity antenna system, the Head End is the circuit connected to the loop itself. You may recall that its purpose is to convert antenna current into a signal voltage to send the receiver. As designed, the circuit is amazingly simple and configured for a single 5V supply. Antenna current goes into the inverting input of the op amp, while a resister network holds the non-inverting input at a virtual ground. You will notice that the antenna is simulated by my LTSpice Loop Model, and also I have added a vendor-supplied model for the op amp itself. Now, the critical parts in this circuit are the feedback or transimpedance resistor, Rf_tia, and the compensating capacitor C1. Rf_tia sets the amplifier current-to-voltage conversion factor. In the circuit above, Rf_tia amplifies the current by 1200. You can calculate that this takes a 1nA antenna current to an output voltage of 1.2 μV. Pretty good. But what is C1 for? Transimpedance amplifiers are inherently unstable at higher frequencies, caused by the input capacitance of the op amp and the loop amplifier. You add C1 to provide a countering force to compensate. The theory and formula to calculate this capacitor is provided in the LMH6629 data sheet. To increase gain, you need to increase feedback resistance. To ensure stability and prevent oscillation, you need to add a compensating capacitor back to the inverting input. The problem is that the Rf_tia and C1 RC combination also creates a low pass filter. The cutoff frequency for this filter is calculated as 1/(2πRC) which you will find is 66 MHz, which is fine for my HF coverage. You have probably read the you can increase TIA gain by increasing the value of R. But at the same time, if you increase R, you lower the cutoff frequency. So, if I increase the resistance to 10k, I move the low pass filter cutoff down to 8 MHz. Lots more gain, but no more wideband coverage. From my simulations, I find that you can use a feedback resister between 600 to 3000 Ω with the 2 pF compensating capacitor while maintaining wideband coverage. As shown above, you can easily use LTSpice to model various transimpedance amplifiers. For AC analysis, you set the frequency range and the input field strength and measure the results with a Bode plot. Things to check are gain, stability and bandwidth. For transient analysis, just replace the loop antenna model with a current source to simulate antenna current at a specific frequency. You should find that the LMH6629 provides enough gain and plenty of headroom for strong signals.